The second week is where all the excitement is. I made plans with my best friend who lives in Hong Kong (I'm very very jealous) to get our hair done and to go to LKF on Saturday. 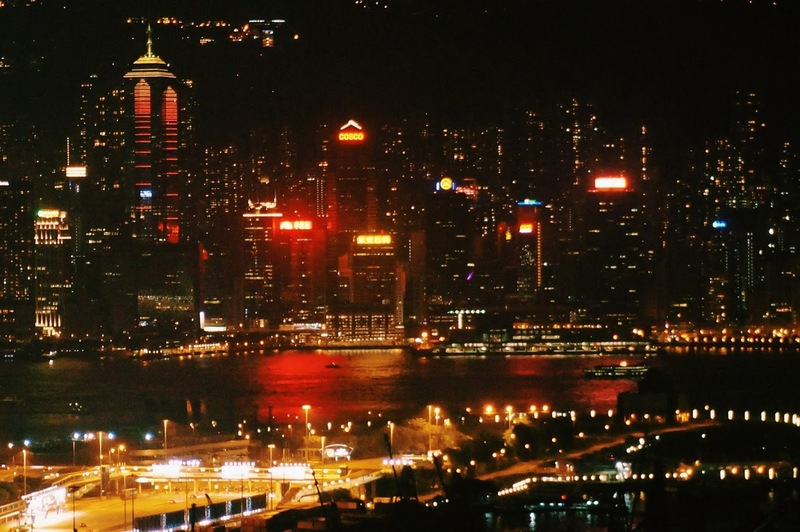 LKF abbreviates for Lan Kwai Fong which is the clubbing and party district of Hong Kong. I remember having such a good time last year making some many memories, So I went this time again. 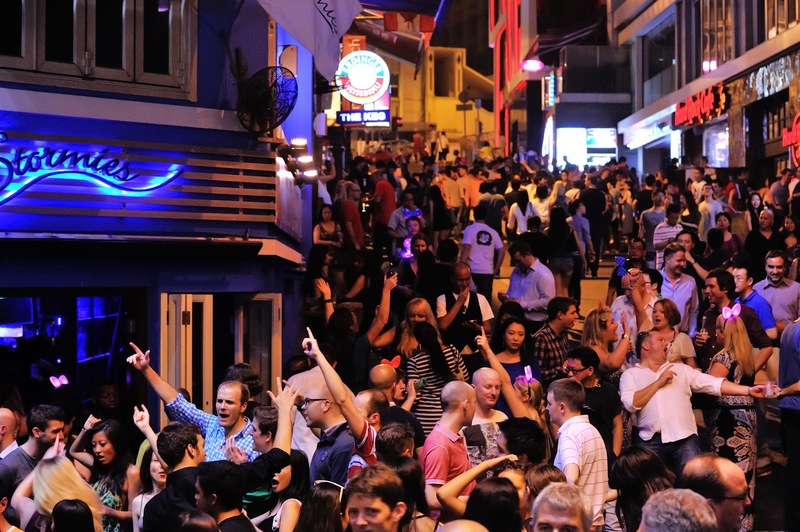 When you go out in LKF, don't expect people to be dressed up. The girls literally wore trainers, a pair of shorts and a tank top. Me and my best friends looked at each other and were like 'we are soo dressed up.' When we go out in the UK everyone makes an effort, therefore it's eye-opening in terms of culture and night life. Now let's talk clubs, there was no door charges to go into a club, but there were queues, depending where you went. My best friend took me to Levels which had an elevator that leads you to the club, we got in, walked around a lap and walked straight back out. The music was really bad and the layout of the club was not that good. We were thinking 'where is the dancefloor?.' And moved on to Magnum and Beijing, which are clubs more appropriate for us in terms of music. It was quite packed, so be prepared to be shoved around. If your a girl, there might be a lot of hand grabbing, and you get surrounded by boys. So stay safe! In terms of drinks, it can be considered as expensive, my best friend advised me to take $500hkd, but I don't drink much, therefore spending less. Regarding bars, we went to Insomnia before heading to the clubs, the place has a really good atmosphere and the live band is amazing. You find a lot of international people and tourists here, so if your looking for a place to hang around or start the night, I definitely recommend here. We had a great night and went home with blisters on our feet from our heels! Needless to say, it's one of the best locations if you are looking to relax and enjoy night life. Getting back to the hair. Now, if you look back into my pictures - my hair is pretty long, and what I wanted was to go lighter and have about 3 inches took off, so eventually I can have a silver/ash blonde ombre thing going on with healthy ends. It didn't happen. 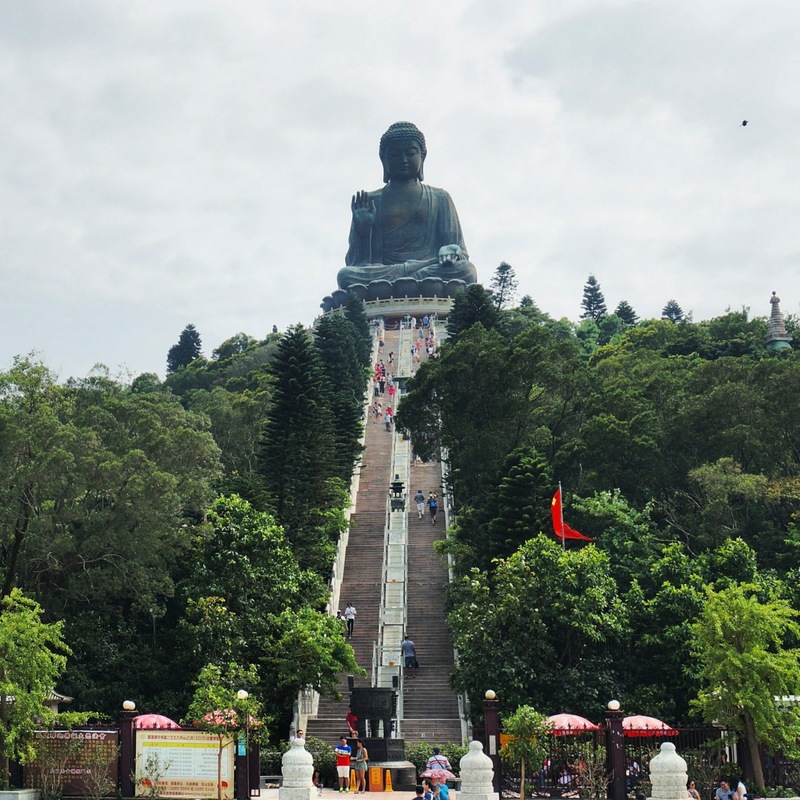 The place I went to was a local salon called Fit Salon in Sai Kung, and my best friend has had her hair cut there a couple of times before, so she suggested there. The owner of the store said he was the colour expert and knew EXACTLY what I wanted the previous day before I went and said to trust him because he knows what's he's doing. BIG MISTAKE!!! So in the consultation he said he is going to highlight my hair, so he can achieve that ombre look. - there's me thinking, I didn't come in for highlights, so I was like WHAT?? and he was like 'oh trust me, trust me, I know what I'm doing'. So I was like okay.... and he then he said to put another dye on it to blend in my hair..... ( By the way I wanted my natural roots, so I don't need to colour my roots all the time) for it to become a shade lighter and become more even. ( And I SAID that's not what I want and he just kept repeating 'I know what I'm doing, trust me, trust me'). So then I was like alright do it, and we'll see how this turns out. His reply: 'the colour will look better once your hair it's dry' and 'you just need to move your hair around so the colour is evenly distributed'. *moving my hair around*. I was at the salon for about 3 hours now -.- , fuming and ready to flip. And I repeated 'this is not what I wanted, you don't know what you are doing'. His reply 'this is what you wanted', 'I need to cut someone else's hair, they've been waiting a long time, I'll come back .' and walked away. A LONG TIME?? 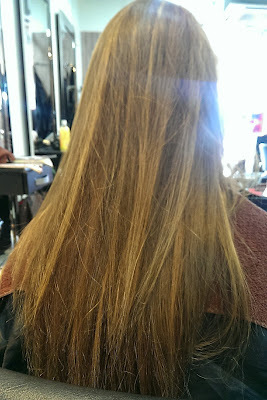 I arrived at the salon at 11am !! He should of listened to how I wanted, having asian hair I know what works out and what doesn't! It's all about canceling the tones. Therefore the time he spent with someone else, I was looking through colour charts to tone down my hair. I just wanted to leave and got up and went to pay. He was like 'it's $500 for the highlights, $500 for the colour and $135 for the haircut. I already haven't charged you for the second colour.' I was just gobsmacked. Paid and left. My advice: just don't go. I am NEVER going back again. I left the salon at 7:30 pm. This meal was after my night out, I was extremely tired and dehydrated, so I drank loads and loads of tea before any food actually arrived. I think the waiter looked at us funn due to the amount of times we asked to refill the teapot haha. 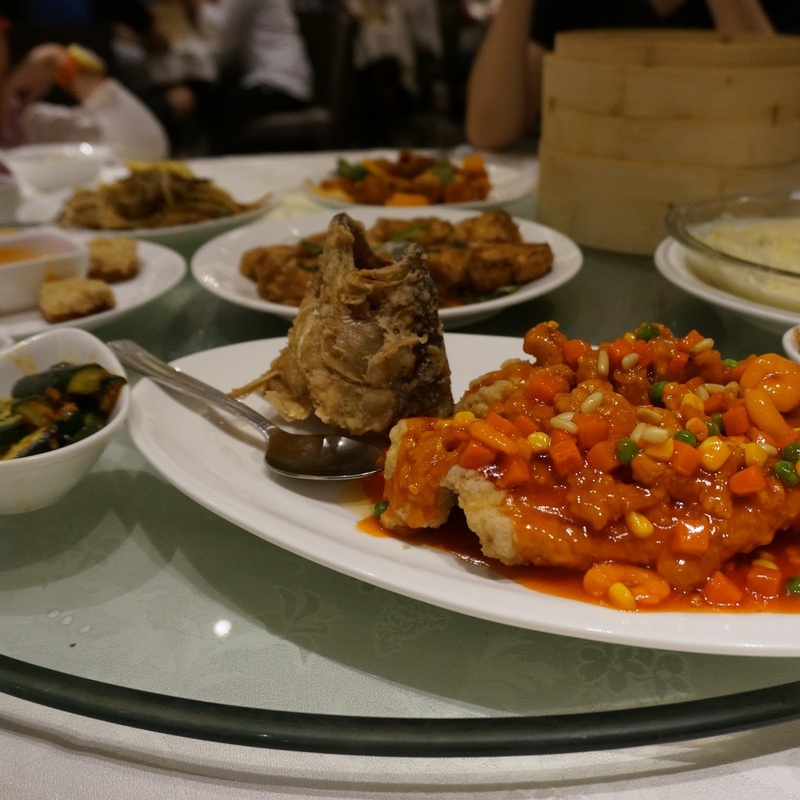 In the restaurant we ordered some of the following dishes: Fried Fish in Sweet an Sour sauce, Pork Dumplings, Peking Duck, Sesame prawn toast and a lot of other dishes. I found the fish to be fishy (sounds silly) as they haven't gotten rid of the sea smell. 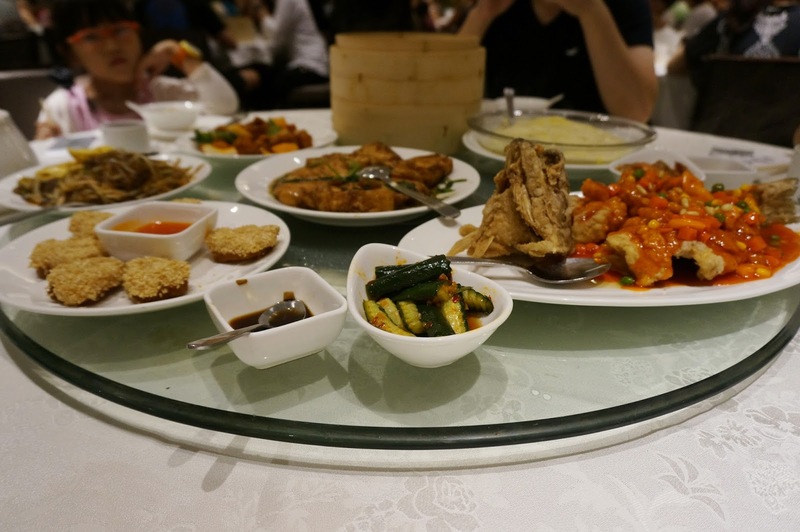 The Peking duck was extremely crispy, one of the best dishes that was recommended. The Pork dumplings was the store specialty, but I found it to be average tasting, but better than a previous restaurant we tried (here) The overall experience was satisfying, so definitely a good try. 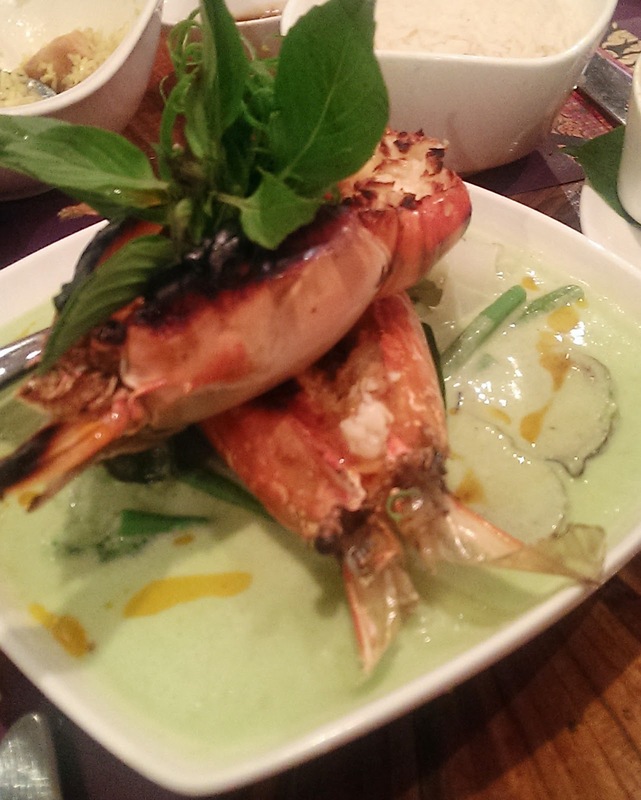 It's the locals favourite, so you can't go wrong with food choices. If you have a sweet tooth like me, you need to go and have dessert every night. I am mango and watermelon obsessed, and I order anything that contains them in. 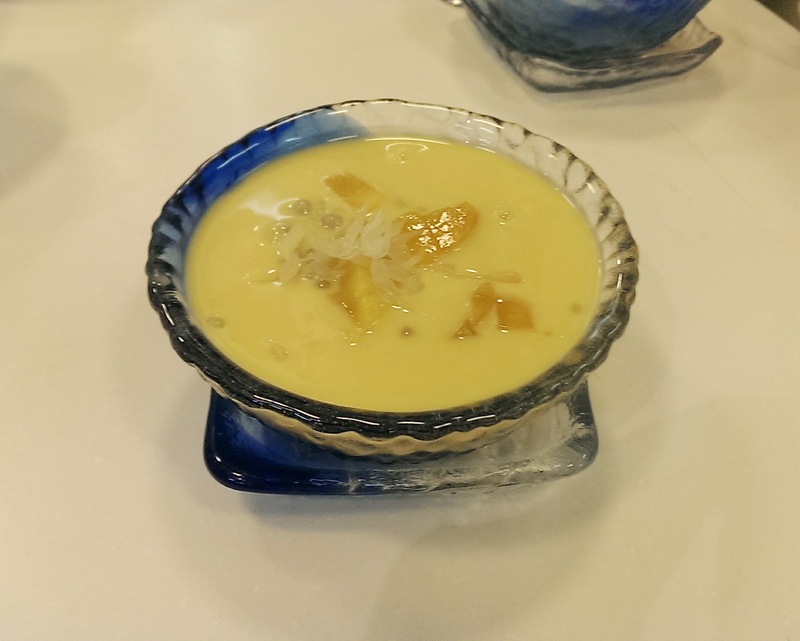 One of my favourite desserts and Hong Kong's best is the Mango Sago with Pomelo, that I am craving right now! A must try from me! On the last full day, signal T3 was put up in the morning, which is to acknowledge a typhoon storm is coming. And I was told to keep an eye out on the weather to make sure we were able to get home safe since we went to Mong Kok to have a last minute shop. While we were walking to a Korean restaurant (Seoul near ladies market) , I kept catching snippets of people's conversation saying signal T8 was going to be issued, therefore shops are going to close early. 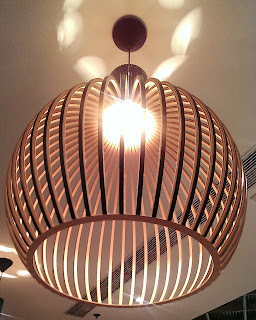 So the end story of the Korean restaurant is: no photographs of my meal, because I wanted to get away. so me and my little sister walked extremely fast towards to direction we called home. The shops near where we stayed started closing the shutters before 4pm, so workers can get home safely. 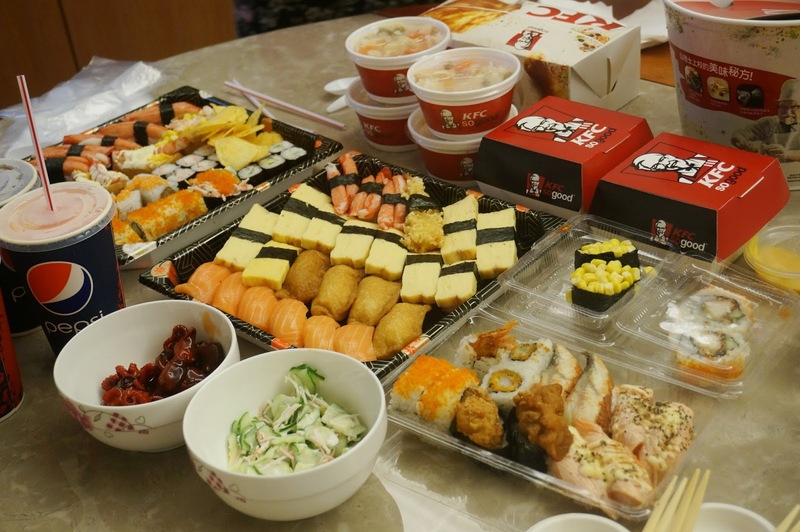 We were going to eat out on this last full day, but instead we opted for KFC and Sushi which we picked up. 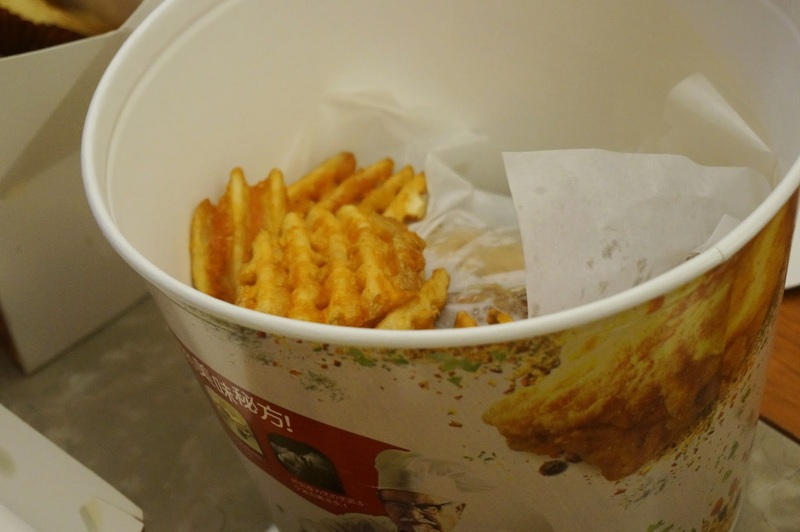 KFC in Hong Kong is soo different from the UK, instead of fries you can chose mash potatoes with gravy, mushroom rice, chicken rice or criss-cut fries. 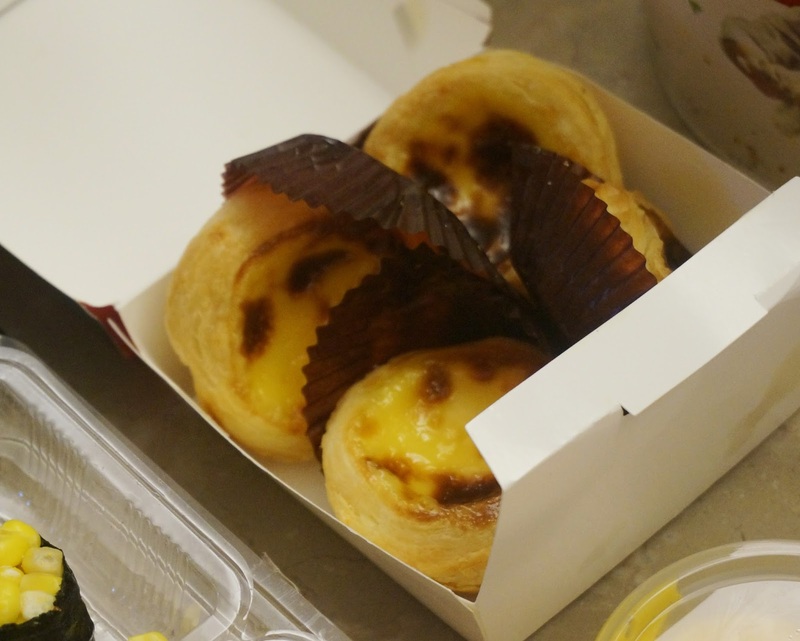 The option to also purchase egg tarts as a snacks (which I have to say is delicious) and many different flavours of chicken such as BBQ, Flava Crava ? and chicken wings in a snack box. One of the best things? KFC and McDonald's deliver o you home. For dessert that night we had mangoes, fruits and a range of different cakes. 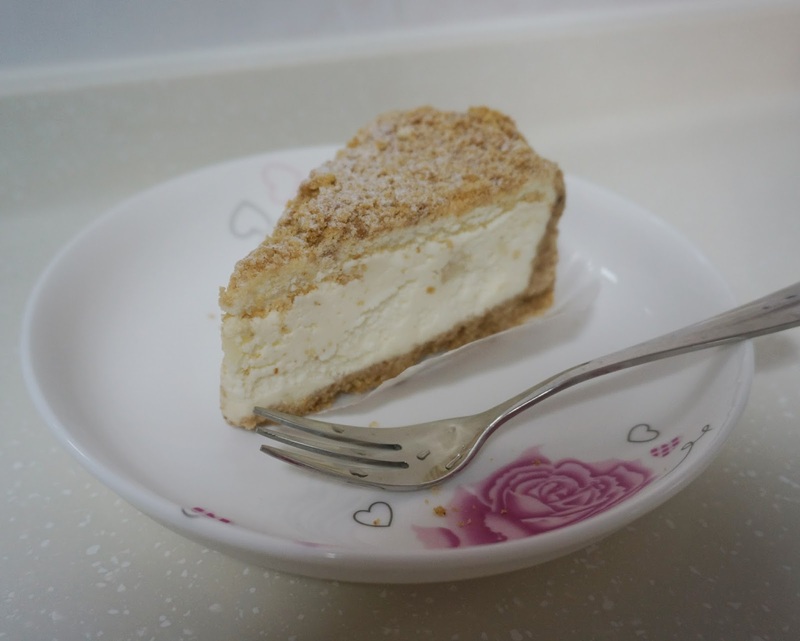 The above pictured is a cheesecake which had a biscuit crust, which was delectable and smooth. 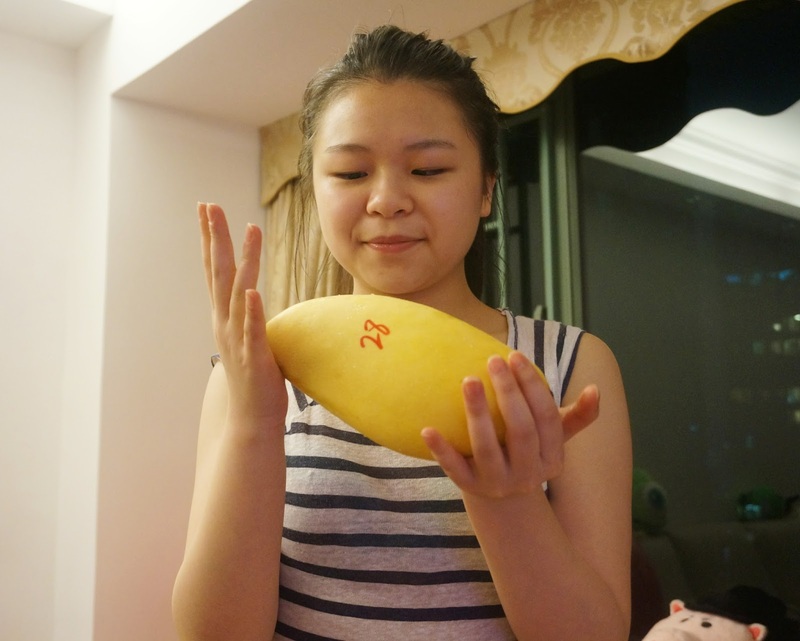 And we played majong until 1/2 in the morning. 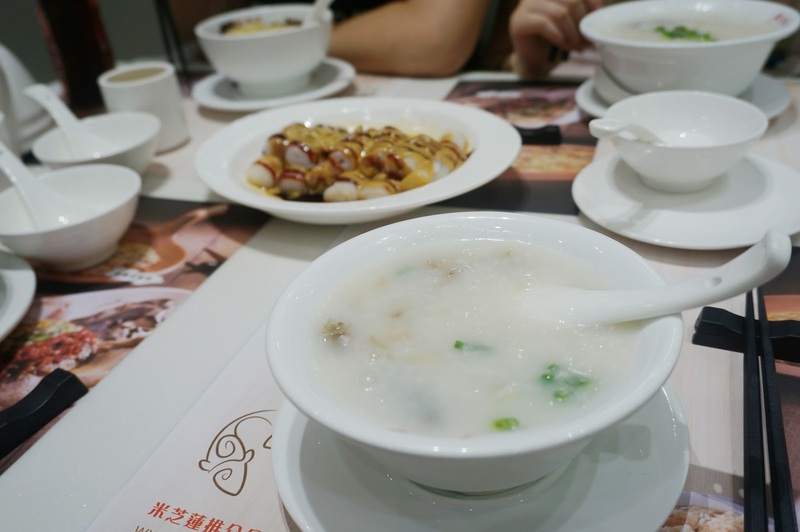 After taking some blog photos (blog post here), we went to Trusty Congee King for lunch. I personally love congee which I describe as rice pudding but with a Asian flare. It's great comfort food for when you ill and helps your digestive system. 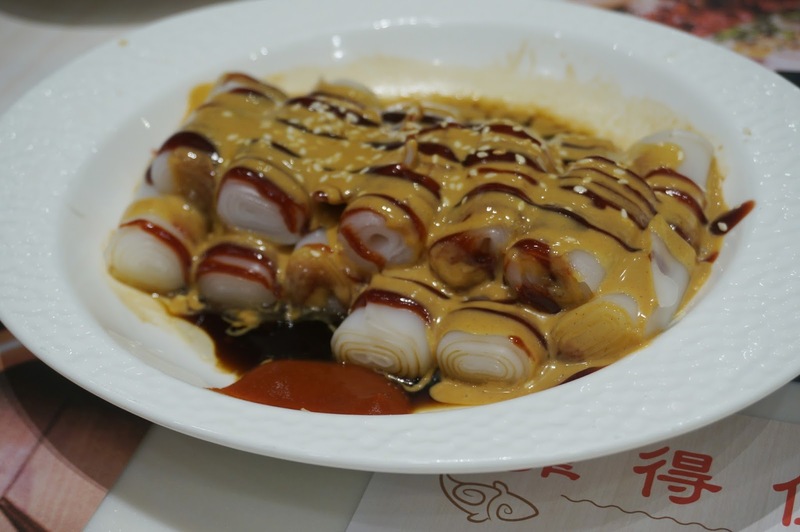 This was also the first time I tried Cheung Fun in peanut butter sauce, the taste was unbelievable you just wanted more and more, I felt a little sad after it was demolished! 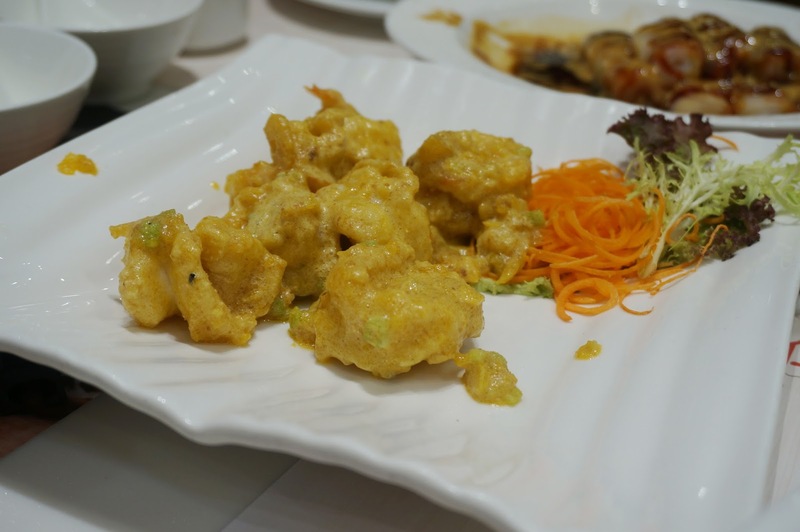 The salted yolk king prawns were recommend by my brother in law, but unfortunately we got a bad batch, the dish is supposed to be quite dry, but it didn't appear that way, so this was a miss for me. But the overall experience was tremendous and staff was extremely friendly. I've have touched upon what I have done throughout the day here, which consisted of packing and last minute shopping. 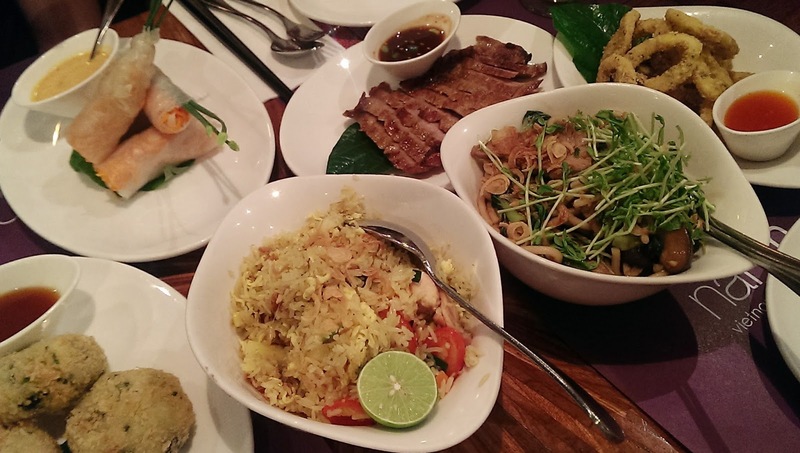 After our luggage was dropped off we went to the elements shopping centre and had Vietnamese and Thai food at Nahm. 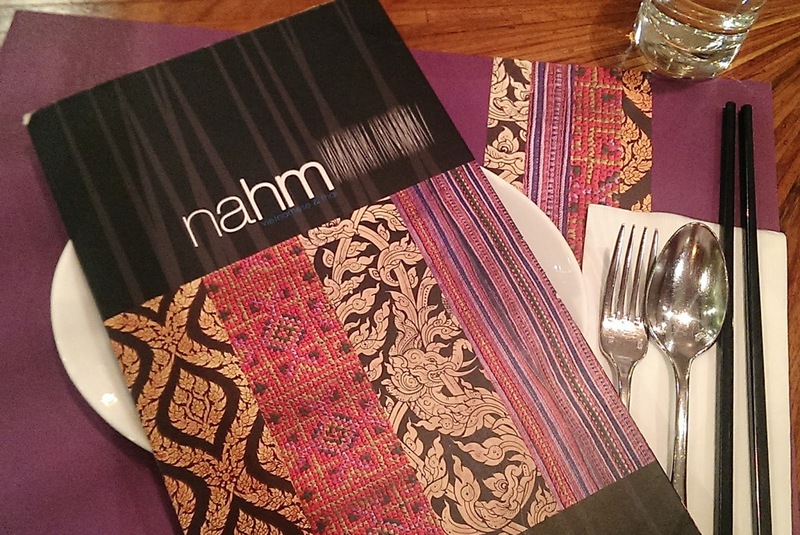 Nahm is one of the best Vietnamese and Thai restaurants around (I researched this after) and I am not surprised why. There was a queue in order to get in as we didn't have reservations but it only took about an half an hour wait, by then we were exceedingly hungry, so we couldn't wait to order. 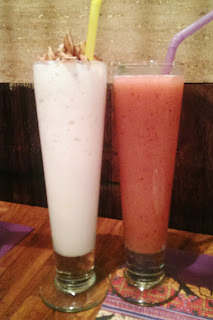 As you can tell we ordered a lot, first starting with a mocktail called Dragon's blood, which is from the juice of dragon fruit which is refreshing and gave me an appetite. For starters we ordered Vegetarian rice paper rolls with peanut sauce, which was very crunchy due to the ingredients, Salt and Pepper squid with pickled star fruit which was crispy and Deep fried crab meat with mash potatoes with pineapple dipping sauce, which I extremely loved as it was heavenly. For mains we ordered Grilled marinated pork neck with tamarind and chilli, which was crisp and well cooked, Fried rice with chicken, pineapple, spinach and crispy shallots, which was my favourite as it brings back a lot of childhood memories, And the finale Tiger king prawns in green curry with beans and bay spinach, which I have never had so I don't know what to expect. And some Baby Pak Choi with crispy garlic, which literally was drowned with garlic. Needless to say we were full to the brim, and we needed to take a walk after the meal! This tells you a lot if you need to move around in order to digest your meal. I definitely will be coming back here next time! It was a good farewell meal. We headed to the airport after this so it's a big final GOODBYE! That sushi is making my mouth water oh my! This looks like such an awesome place to visit, so rich with culture, I'd love to go one day!